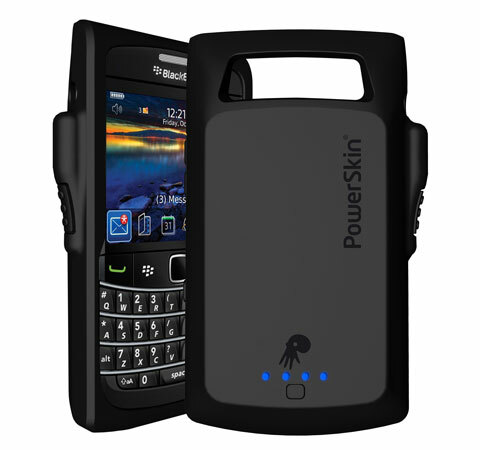 Modesto, CA – July 18, 2011 – PowerSkin® is rolling out new battery-boosting, shock-absorbing skins for the BlackBerry Bold and Curve series, offering a $10 discount and free shipping (within the continental US) for all pre-orders placed through the end of July. The BlackBerry Bold PowerSkin®, compatible with model 9700 (AT&T and T-Mobile) and model 9780 (T-Mobile), provides up to 230 minutes of extra talk time. The BlackBerry Curve PowerSkin®, compatible with model 8530 (Sprint and Verizon) and model 8520 (T-Mobile and AT&T), provides up to 225 minutes of extra talk time. Both the Bold and Curve skins boast 1150 mAh of battery capacity. Both skins feature an optically engineered camera lens window, ensuring no interference with the camera, also eliminating any flash glare from the skin’s surface. To charge, simply plug the charging cable into a laptop or wall, and the XPAL Powered™ battery technology will automatically charge the phone first, followed by the PowerSkin®. 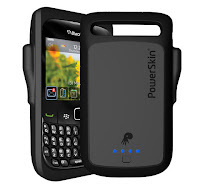 PowerSkins® for BlackBerry Curve and Bold will be available at the end of July for $59.99 on www.Power-Skin.com, pre-orders can be placed on the site now to receive the $10 discount. Also, follow PowerSkin® on Facebook, at www.facebook.com/PowerSkinCases, and on Twitter to find out about upcoming promotions for the BlackBerry series. PowerSkin® silicone cases with built-in batteries provide twice the power for your smartphone, featuring sleek, protective designs that fit your phone and fit your style. PowerSkin® is XPAL Powered, meaning it’s charged by patented battery technology that reflects the highest standards for safety, quality and performance. Designed to be your go-to, go-anywhere, go on-and-on power source, PowerSkin® has got you – and your phone – covered. For more information, visit: www.power-skin.com. XPAL Power, a subsidiary of TennRich International, is a California-based corporation with its sales and marketing team located in the United States. The TennRich design team is located in Taiwan, and the company-owned factory in Shenzhen, PRC is the first factory in China to focus on rechargeable lithium polymer batteries and is currently one of the largest manufacturers of portable power packs in Asia. The XPAL Powered™ seal stands for quality, safety and efficiency – a guarantee that these traits are inside every product that authenticates through the XPAL verification service. XPAL Verified™ is an authentication process that underscores our commitment to quality, using complex algorithms to detect and transfer battery serial numbers to verify its legitimacy – a safeguard customers can trust. For more information, please visit www.xpalpower.com.